What’s most remarkable now about that teaser for The Incredibles is that it appeared almost a year and a half before the film opened in theaters, in November of 2004. Today, such a teaser would be nigh unthinkable. (This excludes marketing materials like posters, as such upcoming animated movies as The Boxtrolls are already advertising to audiences, but not with actual teasers.) The Walt Disney Company has, for whatever reason, decided to scale back on the distance between a movie’s first teaser trailer and the movie’s domestic release. Frozen, the next film from Walt Disney Animation Studios, opens this November, right before Thanksgiving, and the first teaser was released online just over two months ago, in advance of being attached to prints of Monsters University. With Pixar specifically, their upcoming film The Good Dinosaur is just about nine months from release, and not a single teaser has been released yet. (One presumes it will come attached with Frozen this November.) It may be a bit strange to advocate for more marketing, especially since so many movie trailers these days feel terribly unremarkable and forgettable, but that’s what needs to happen once again at Pixar: they must rediscover the art of the teaser. Hard as it may be to believe, there is, indeed, an art to this form of advertising, especially in the world of animation. Pixar, in its earlier days, was more than happy to play around with the very concept of trailers for their movies. (A unique example was recently mentioned here: the ad for Monsters, Inc. that was deliberately attached only to prints of Harry Potter and the Sorcerer’s Stone to entice moviegoers to see both movies, instead of just the first story of The Boy Who Lived.) Teasers for A Bug’s Life, Monsters, Inc., and Finding Nemo all allowed Pixar to show off their animation prowess and cleverness just a bit more. A recent example that heightens whatever existing mythology there is surrounding Pixar’s history is the teaser for WALL-E, whose advertising was as daring as the movie itself. The teaser started with the film’s director, Andrew Stanton, describing the process by which a handful of Pixar’s high-concept films were created: at a 1994 lunch at the fabled Hidden City Café where Stanton, John Lasseter, the late Joe Ranft, and Pete Docter talked about the future. Stanton explained that the discussion was borne from the notion that if Toy Story ended up being successful, the Pixar brain trust would have to think of other movies to make. And so ideas of talking bugs, monsters, and fish were debated and discussed. Plus some idea about a lovelorn robot named WALL-E. There was, of course, a long and storied period in American cinema when filmmakers made appearances in trailers for their movies. Alfred Hitchcock, for one, was well-known for introducing his movies as being the dual pinnacles of horror and suspense; though he would only make a (sometimes literal) walk-on appearance in the movies themselves, he had a habit of popping up in his trailers for more than a few seconds. But for Pixar to stake one of its strangest, riskiest films by starting out with a filmmakers’ roundtable being described is truly astonishing. Most kids—hell, most audiences—probably wouldn’t have been able to identify Andrew Stanton out of a lineup, but he was arguably the face of WALL-E’s marketing campaign at the outset as much as the lovable robot was. Monsters, Inc. had Billy Crystal and John Goodman riffing; Finding Nemo had Ellen DeGeneres and Albert Brooks doing the same. WALL-E had almost nothing but a robot who didn’t speak any recognizable language. It’s just stunning that WALL-E pulled it all off, starting with that teaser. This issue extended to Monsters University, although Pixar did begin the campaign early, if stealthily and uniquely. 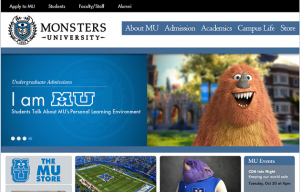 While they did offer a teaser in theaters last June, Pixar also teased the film subtly online with a fake website for the titular educational institution. As such, many of the initial ads for the film were really ads for the university, focusing on monster students who weren’t Mike or Sulley. So, on the one hand, Pixar was maintaining its hold on cleverness—so much of the fake website felt disturbingly like real college websites. But it also felt like they were focused more on a viral marketing campaign than on coming attraction-style teasers, which is a letdown. The Good Dinosaur, set well before the present day based on what little information has been released, won’t have such an advantage in viral marketing. Instead, Disney seems more willing to hold things close to the chest. It took until only a few weeks ago, at the D23 Expo, for the voice cast of The Good Dinosaur to be revealed, including actors like John Lithgow, Bill Hader, Neil Patrick Harris, and Frances McDormand. While there’s nothing wrong about wanting to keep things secret, to not give away any of a movie’s surprises, teasers that leave audiences on the hook, wanting more, are among the best reasons there are for trailers to exist at all. If you’re reading this article, you probably don’t need to be convinced to see The Good Dinosaur. It’s a Pixar movie, and it’s an original concept, which doubles the excitement for many fans. And Pixar does not need to sell us on this film; what’s more, its announced cast is intriguing enough that it hasn’t set off any warning bells for most people. But then, Pixar didn’t really need to sell people on WALL-E, did they? A new film from the director of Finding Nemo, a futuristic setting, an original concept: such phrases are catnip to most Pixar devotees. Why put forth the effort in advertising that film so early? Perhaps WALL-E was a bit more of a tough sell, not because of the science-fiction angle but because of how the first 40 minutes was mostly dialogue- and human-free. Certainly, The Good Dinosaur has a slightly easier way to attract younger audiences—hey, look, dinosaurs! However, it takes place in a world whose high concept—what if dinosaurs didn’t go extinct and managed to coexist peacefully with humans?—may not be as easy to sell as Disney imagines. What is the harm in teasing a movie like this a year in advance? Perhaps this fear is inspired by that teaser for Frozen, which promises a movie that likely does not exist. (To be clear: the goofy snowman character at the center of that ad is being used for a lot of the film’s marketing, even if Frozen is essentially a retelling of the Snow Queen fairy tale, features Kristen Bell and Idina Menzel as its leads, and is as much a return to the old-fashioned Disney musical as Tangled was. That movie hasn’t been teased at all.) There is a craft to making a great movie teaser, and for a long time, it looked as if Pixar had mastered it, or was coming very close. They’ve backed off over the last couple of years, so until they attach, perhaps, a teaser for Inside Out in front of The Good Dinosaur, all we can do is hope that they’ll utilize those scant few minutes before the feature presentation to hook audiences once again on their new, unfamiliar, bold, and original future films, and do it earlier, not later.